The proposed new name is Arroyo Food Co-op. The next fete is September 5. Big community meeting coming up October 10. Show your support and check out details at www.altadenawantsacoop.com. Wish I had more time to write a long story about this. More when I can. August 29 is the date for the next Altadena Heritage event. Topic: Irrigation. Many say water availability is in danger and we need to do what we can to conserve. Find out what you can do. 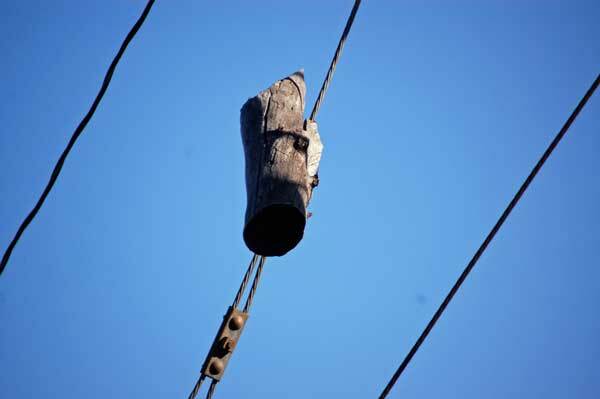 Got the story about this bizarre log that has been lodged on this power or telephone line for years. It’s in front of a house that used to be an eyesore before getting a facelift. There was a huge tree next to these lines, and this piece ended up on the wire instead of the tree. New owner Lauren has been trying to get the utility to remove it, but they refuse. They say it’s not hurting anything so they won’t remove it. Well it hurts curb appeal, but I guess it’s nothing compared to those ugly wires and cables and telephone pole sitting right in the middle of his front yard. So that’s what intrigues me…how in the hell did a pole get put in the middle of someone’s yard? It couldn’t have been put between the houses? It’s a matter of a few feet, and would have improved the property values. Any ideas? Just another case of bad development?